I hope that you are already feeling the gainz spread throughout your body. 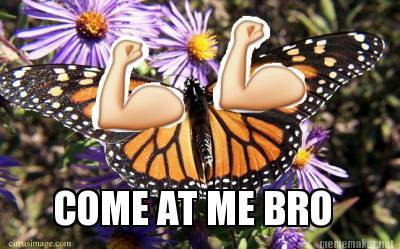 Like the pathetic skinny caterpillar, you are preparing to wrap yourself in a protein cocoon, and emerge, in mere weeks, as a majestic, disgustingly swole monarch butterfly. Except your lats are your wings. And with them you will be able to fly. So fly my brothers. Week 2 we’ll continue to consistently hit the big lifts, changing up our Monday and Friday conditioning slightly to mix it up. 5 rounds- 8 Hang C&J (clean&jerk), 15 sit-ups, rest 30-60 seconds. Weight for C&J should be light enough that you can go unbroken with proper form for ALL rounds (aka much lighter than weight used last week). This freakbeast of a man should put you in your rightful place. Remember that you can get there… one day, one scoop, one rep at a time. Nice! Thanks for the early post. Right on time for my Monday workout. I can feel the Tom Hardy traps growing within already! I think Thursday’s WOD broke my body! Specifically, my traps and upper back.